Sense of body balance (equilibrium). of temperature in the environment surrounding them. Fall of temperature – Cold. Chemoreceptors: These are stimulated by chemical change in their environment. Nociceptors: These receptors are stimulated due to injury or damage in the tissue. Due to stimulation of these receptor, unpleasant sensations are felt like-pain, irritation or discomfort. Photoreceptors: They are stimulated only by light causing perception of vision. Example– Receptors in retina of eyeball called rods and cones cells. Osmoreceptors: They are stimulated by change of osmotic pressure in the tissue. 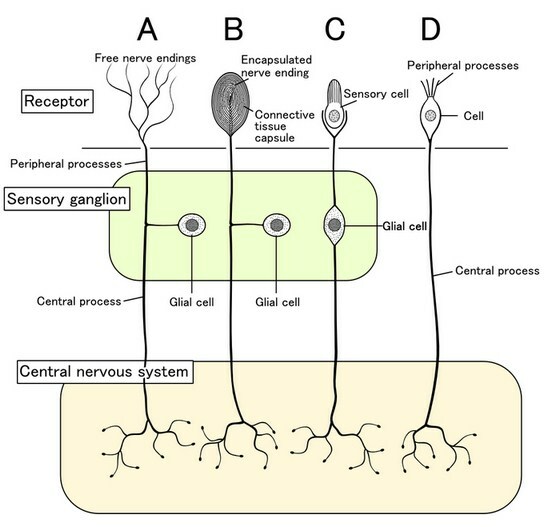 In general we know that receptors are specialized cells present in the peripheral tissue from where start the sensory neurons to carry the impulse. These afferent (sensory) neurons carry impulse to the central nervous system. Variation in this usual structural pattern divides receptors in three different types. In first variety the specialized cells are epithelial cell. So the receptors are called epithelial receptors. Majority of the receptors are examples of this type. Sometimes, these specialized cells forming receptors are modified neurons which are present in the epithelial lining, as are the bipolar neurons in the epithelial linings of nose, carrying sensation of smell (olfactory sensation). These are called neuroepithelial receptors. In third variety, no specialized cells are present to be defined as receptors. In this case, free nerve endings of peripheral dendritic processes of first order of sensory neurons themselves act as receptors. Examples are nonencapsulated exteroceptors (cutaneous receptors). These are named as neuronal receptors.